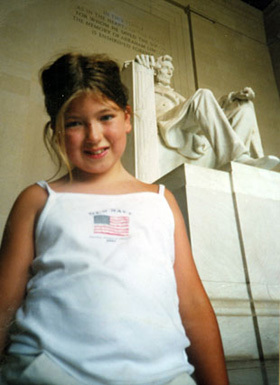 Julie Hembeck, age 11, on vacation in August 2001 at an undisclosed location. Granted, I'm not a religious fellow, but if you have any empathy for me whatsoever, any at all, I beseech you, pray for me!! For today, officially, I become the father of...a TEENAGE GIRL!?! I've never quite figured out the best way to tell this story, but considering the significance of today's date, I figured maybe just barreling through it may work best. There aren't very many opportunities for gags in this tale, y'see--though I DO promise you a happy ending! It all began back when Lynn and I FINALLY decided we wanted to have a kid--I mean, we were only together 16 years before Julie was born, but hey, what's the rush? One has to take the time to properly prepare for as monumental an event as the birth of one's only child, dig? And prepare we did. Lynn was about as diligent as a mom-to-be could be during her pregnancy. She ate only what she was supposed to, rested when she needed to, and, for the entire nine month period, laid off those Cuban cigars she loves so very much!! (That was one of the jokes, folks...) And me? I dutifully attended the Lamaze classes, watched the baby-rearing videos taped off of Lifetime, and helped think up names. But there wasn't much I could do on that Saturday in late summer except drive Lynn carefully but quickly in to the Birthing Center 20 minutes from our home. It proved to be a long day, with close to 12 hours elapsing from our arrival into the facilities until Julie's arrival into the world. Lynn's pregnancy had been overseen by a pair of doctors, one older and more experienced, the other younger and, well, not nearly as experienced. The one performing the delivery? Luck of the draw. Guess which one we got? Aw, Julie's always been a bit contrary, so why shouldn't she start her life that way? If she wanted to come out dragged by a pair of tongs and with the umbilical cord wrapped tightly around her neck, well, who's to say she didn't plan on a memorable--if highly distressing--entrance as part a life-long bid to grab attention? Well, she sure had it there! Suddenly, the good vibes in that hospital room shifted and things turned all "er", as our infant child encountered fresh air for the first time, but was unable to simply breathe it!?! You know those scenes in films where the nurse hands the mom her newborn and she gets to make mushy sounds at her beautiful little offspring? Didn't happen. They whisked Julie away with a sense of urgency that had us all pretty scared (Grandma was on the premises, as well). Turns out her oxygen had been cut off for at least 90 seconds, and well, without committing to any sort of prognosis, that COULDN'T be good, now could it? A female physician, from the Far East I believe, was also on duty, and was roundly credited with saving our daughter's life. We were all obviously appreciative, but events were happening so rapidly, so stunningly, we barely had time to take in one twist before another turn was presented to us. We pulled ourselves together, took a deep breath, and drove up to Albany the next day. The news from the docs wasn't all that encouraging: Julie had had a seizure. What exactly this meant, I don't specifically recall, but it could've easily been the first of many, and we were duly instructed to watch out for any repeated occurances. Here's where I share with you the first morsel of good news in this saga--it never did happen again. No more seizures. Ever. And thus, no special drugs to control them. Fact is, for all her obstacles growing up, Julie has never had to rely on pharmaceutical solutions to solve her problems, and considering how drugs appear to be dispensed willy-nilly these days, that's gotta qualify as a positive as well. Was Julie's condition anyone's fault? I tended not to think so, figuring it was just one of those unavoidable accidents of nature, but who's to say? However, I did know spending all our time and energy suing someone wasn't going to help Julie a whole lot, and besides, we preferred to think positive. Luckily, we had a couple of years of continual improvement under our belts before Lynn stumbled onto a medical program on cable television that dealt with a situation analogous to that of our daughter's. That's when we realized exactly WHY the doctor's seemed so reticent with their long-range prognosis--clearly, Julie was already towards the top twenty per cent of cases that make full or nearly full recoveries. She probably was never gonna make it all the way to one hundred per cent, but, as we learned from the tube, it could've been worse, far, far worse. Y'know, maybe it was a GOOD thing the docs didn't lay it all out for us. It was easier just hoping for the best when no one had filled your head with visions of the worst. Julie had what they called "developmental delays". Hypotonia was the medical term, I believe. Basically, it meant that everything happened later for her. She took her first unassisted steps at 26 months, and truly began running (as opposed to merely walking fast) just after turning five. All her concerns were physical, though, and I still beam with pride when she identified more vocabulary words during a test given to her at age four than any other child her speech therapist yet encountered!! Yup, she was one smart kid--and happy, too. We were all going to get through this, and we weren't going to do it alone. During those early years, starting right after she turned two, Julie was afforded first part-time, and then full-time, physical, speech, and whatever-else other therapies deemed necessary for her, all without cost to us--AND, in the latter years, during full day pre-school programs! Other folks paid a pretty penny to have their toddlers taken care of during the day, but we got all these services for free!?! Okay, we certainly did pay a price of sorts for this so-called bargain, but hey, I've gotta make lemonade out of that nasty ol' lemon somehow, comprende? In any event, these early intervention programs wound up doing her--and us--a lotta good. Would she have progressed as nicely on her own? Probably, but it was still good to have this safety net available to us. As the years wore on, Julie has developed pretty close to the point where she should be. Oh, if you met her, you might detect a certain cadence to her voice that indicates a slightly shorter than average breath intake, and she's always likely to finish towards the back of the pack during a foot race, but the Julie who turns 13 today would have to be considered far luckier than the Julie who popped out 13 years ago gasping for air. We don't think of her as being handicapped--no one who gets to know her does--and I've been reluctant to share these facts with you, my loyal readers, as I didn't want any of this to come across in an overly sentimental, syrupy manner. This is her life--this is OUR lives--and things are going along just fine, thank you very much! Lynn and I love the kid like you wouldn't believe, naturally, and there are even times when I think she might feel the same way about us!?! Yeah, she's got her own way of doing things, and not surprisingly, they don't always coincide with the way WE might consider best. And is she spoiled? Hey, what only child ISN'T? But especially since, in her earliest years, Julie truthfully needed our help to accomplish even the smallest of tasks. Thus, as time went on, and she became more and more capable, she also became more and more crafty, conning us time and again into helping her do things she long ago had mastered! Why? Because she could, is why. But she's also a loyal and generous friend, an inquisitive and steady (if not overly studious) student, and in general, a happy, outgoing kid. She ain't perfect--I'll spare you the chapter-and-verse of some of our heated if ultimately silly arguments--but then, her parents aren't always perfect either! I guess you could say, all in all, things have worked out rather nicely.